You probably have never think of this: make an application’s icon redirect to another application on your iPhone, iPod Touch, or iPad. If you have, this is now possible with a jailbreak tweak from Cydia called OpenOther+. 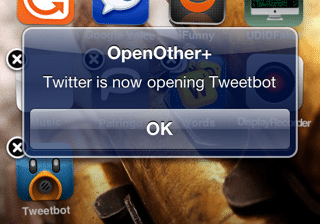 OpenOther+ allows you redirect any applications located on the homescreen to another application you want. For example, let say you don’t like the App Store icon and you would rather use the iTunes icon to open the App Store, this is what this tweak will do. This tweak doesn’t add any additional icon to your homescreen other than adding the option to enable it or disable it in the “Settings”. To use this tweak to redirect another app all you have to do is enter icon-wiggle mode, double-tap quickly on an app to redirect, it will instruct you to do the same for the target app to redirect to. Some will find this tweak completely stupid and useless and others will actually like it. If you’re interested in this tweak , OpenOther+ is available in the Cydia BigBoss defaulted repo for $1.99.